IDAHO-- Boise Library Comic Con this Saturday! I'm excited to be at the Boise Library Comic Con this weekend-- it'll be from 10-5 on Saturday at the main branch (715 S. Capitol Blvd.). I'll be selling and signing books all day at my table, and doing a panel at 1:15 pm (Marion Bingham Room, 3rd Floor) about my work. Also be sure to check out my comics buds Emi Lenox, Farel Dalrymple, and Theo Ellsworth! Toronto Comic Arts Festival this weekend! I'll be in Toronto for TCAF this weekend (May 10-11), signing books at the Top Shelf booth (#228-230; on the 2nd floor, straight back as you enter the big exhibitors' room). It could be argued that contemporary graphic novels broken into the mainstream literary world thanks to their unique ability to vividly recount the best and the worst of the human experience through autobiography, memoir, and history. Join moderator Brigid Alverson (Comic Book Resources) as she interviews some of the top contributors to the genre, including Nick Abadzis (The Cigar that Fell in Love with a Pipe), Meags Fitzgerald (Photobooth: A Biography), Nate Powell (March), Diana Tamblyn (Gerald Bull and the Supergun) and Nick Bertozzi (Lewis and Clark), and Tyrell Cannon (Victus). Discover how to consider, collect, and curate real-life tales of times past to make them new again! San Diego Comic Con schedule-- signings & panels! If you'll be at the gargantuan mind-shredder that is Comic Con International next week, I'll see you there! Come see me anytime at the Top Shelf booth (#1721)-- Brand-new copies of March: Book One will be there, and I'll also have the rest of my books and a ton of original artwork for sale. 5:00-7:00 pm: Drawing with tons of other artists on The Blank Page Project, with artwork auctioned off later to benefit The Hero Initiative (helping take care of our fellow creators, as many of us have no safety net, pension, retirement, health resources, etc.). This will happen outside in the back of the Vela restaurant at the San Diego Hilton Bayfront hotel (next door to the convention center). 10:00-11:00 am: March panel with John Lewis and Andrew Aydin. Room 23ABC. 12:00-1:00 pm: Top Shelf spotlight panel w/ Leigh Walton, Chris Ross, Shannon Wheeler, Mark Russell, Jeffrey Brown, Zander Cannon, Kevin Cannon, Andrew Aydin, and Rob Harrell. Room 4. 2:30-4:15 pm: signing at Top Shelf booth with John Lewis and Andrew Aydin. 4:30-5:30 pm: "Comics And Prose: The Graphic Novel Hybrid" panel with Jeffrey Brown, Cecil Castellucci, Tom King, Jim Pascoe, and Janet Tashjian. Room 26AB. 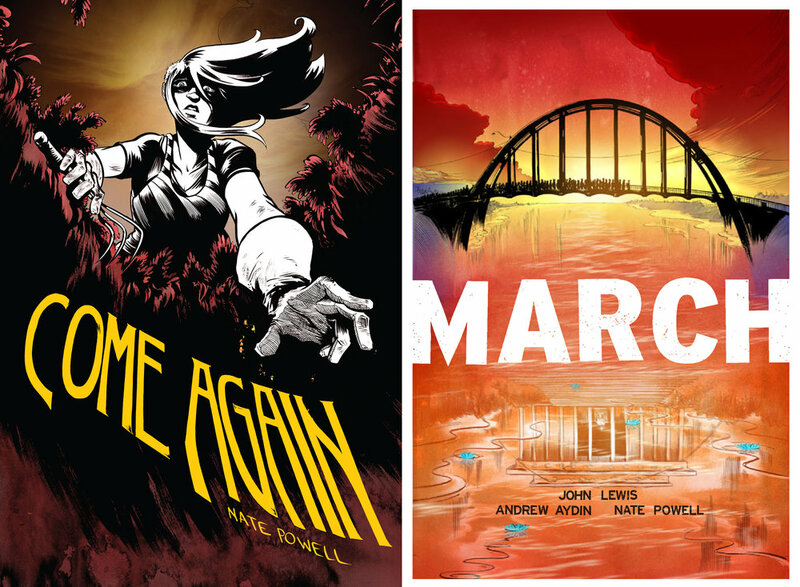 10:30 am-12:00 pm: signing at Top Shelf booth with John Lewis and Andrew Aydin. 1:00-3:00 pm: signing at Top Shelf booth with John Lewis and Andrew Aydin. 4:00-5:00 pm: signing at Top Shelf booth with John Lewis and Andrew Aydin.